The shadow blue frost fox (Alopex Lagopus Forma Domestica) belongs to the Scandinavian farmed foxes. Shadow blue frost foxes have a stripe on the back, and they have a light gray belly and a white neck. The hair of the shadow blue frost fox is a medium-long and compared to the regular blue frost fox it is much brighter. Responsible handling of the natural product fur is essential to us, which is why we refer to our shadow blue frost fox skins exclusively from renowned fur auctions such as SAGA Furs in Finland and Copenhagen Fur in Denmark. If you decide to buy a product from Scandinavian shadow blue frost fox, you can be sure to get a unique real fur product from excellent farms according to European standards. We produce shadow blue frost fox fur blankets, fur cushions, and accessories. If you have any questions or requests, please do not hesitate to contact us. 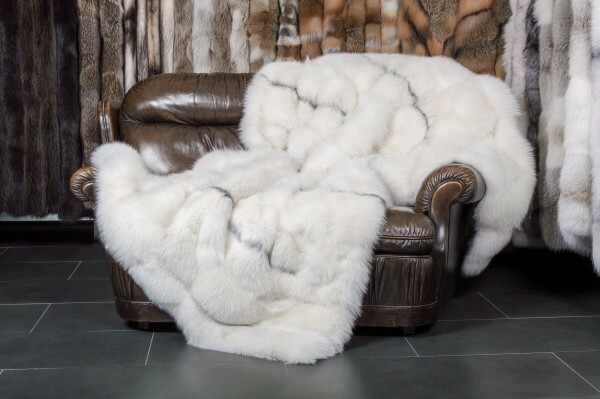 Related links to "Scandinavian Shadow Bluefrost Fox Throw"
Customer reviews for "Scandinavian Shadow Bluefrost Fox Throw"